Part 36 of my youtube countdown rolls on with a performance of Robert Johnson’s ‘Crossroads Blues’ by Bob Dylan and Eric Clapton. I’ve been in a real bluesy mood this week, and a clip like this really hits the sweet spot. 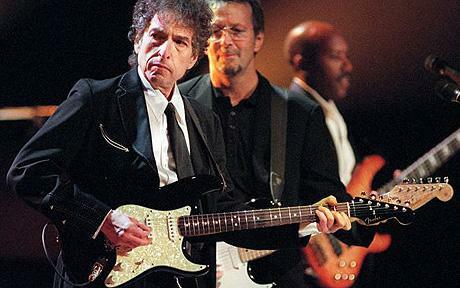 The song, a gem in Robert Johnson’s absurdly mythological repertoire, is heavily electrified by Bob and Eric. I’m guessing its the old Cream arrangement, though I could be wrong about that. While Bob and Eric are having a great time playing this tune, it shouldn’t escape you that these are two of the most devoted Robert Johnson worshipers that ever lived. Before Bob recorded ‘The Freewheelin,” his first album of original songs, CBS executives gave Bob a copy of Johnson’s recordings before they were ever widely distributed or known by anybody. Johnson’s music had a profound effect on him, just as deep as Woody Guthrie’s. In Johnson, Bob heard a ghost lost to time, the most authentic blues folk expressionist he could imagine. Eric had similar epiphanies, but his most striking reaction upon hearing Johnson for the first time was fear. Eric was downright spooked by Johnson’s creaky high pitched voice, and his complex and perfect, not to mention revolutionary, guitar technique. Over time, Eric would describe Johnson as “the most important blues musician who ever lived,” and subsequently did his best to spread his myth and music to the masses. While on the surface, Eric and Bob just seem to be enjoying themselves, with Eric giving a beautiful melodic blues solo, and rarity of rarities, Bob playing an electric solo too, (granted he’s just alternating two notes, but still!). But there is something much deeper going on. I don’t know, but I get over-awed thinking about these two gods of popular music playing the song of a god who somehow sits over them on a higher level. It’s really something to sit back and think of the power surging from these guy’s lips and fingertips; where it all comes from, how it changed the world, and what it all means. It’s a moment a lot of people might ignore, but hopefully realize one day, its utter preciousness in the pantheon of things that matter. Enjoy. This entry was posted on Saturday, April 16th, 2011 at 1:34 am and is filed under Bob Dylan, Eric Clapton, Youtube Favs. You can follow any responses to this entry through the RSS 2.0 feed. You can leave a response, or trackback from your own site. Powered by WordPress v 5.0. Page in 1.161 seconds.